Blood is needed each day in the United States to sustain the lives of patients in need. Whether used for surgery, traumas, during cancer treatment or other life threatening medical conditions, blood is used to provide hope. There are many blood suppliers throughout the country, some are very large blood providers, some a little smaller and others are hospital operated. Community Blood Bank is hospital operated with a joint shared resource of Avera and Sanford Health Systems. Community Blood Bank is different than other blood bank organizations with the sole focus on providing local patients and hospitals with an adequate blood supply. The blood is collected locally, processed locally and transfused to save local lives. When you donate with Community Blood Bank on the bloodmobile or in one of our donor rooms located at Sanford Medical Center, Sioux Falls, SD or Avera McKennan Hospital, Sioux Falls, SD you can be sure the blood is saving local lives. Community Blood Bank is not affiliated with any other blood bank entity. There is a reliance on local donors coming to the bloodmobile to give blood when we are in the community. 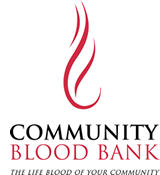 Additionally, unlike many other blood bank entities, Community Blood Bank is committed to only visiting those communities for which we are the sole blood provider at the local hospital. Realizing it is important to donors to maintain proper records on donation accumulation and be recognized when they reach special donation milestones, Community Blood Bank does accept donation totals made to other blood bank organizations. When you register to donate with Community Blood Bank for the first time you will receive credit for previous donations, just let us know how many times you have donated with other blood banks and we will begin where you left off. It is our honor to provide gallon pin markers, etc. to properly recognize your amazing dedication and commitment for providing the gift of life. Community Blood Bank provides blood to over 36 local area hospitals, including all Sioux Falls area hospitals. Each donation and donor is extremely precious to us. To meet the needs of our hospitals and patients within the region, we need 550 donors to give blood per week. When the bloodmobile visits Windom, the goal is to collect enough blood to sustain a healthy blood supply for your community for many weeks after the blood drive event. When you choose to donate with Community Blood Bank, we can address patient needs within the community immediately and save lives. We look forward to your next donation and the opportunity to serve you. You are the life blood of the community.